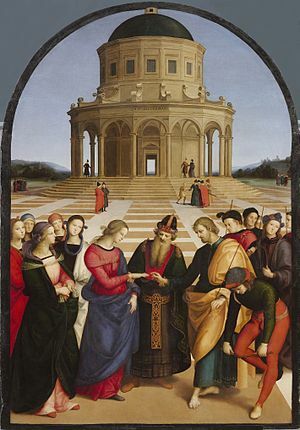 Raphael, The Marriage of the Virgin. Italian Renaissance art is a style of painting and sculpture that began in the late 13th century (1200s) with the work of the painter Giotto and a sculptor Nicola Pisano. The Renaissance way of painting and sculpting did not become the usual style until about 100 years later. From 1400 to about 1600 many artists in Italy used and developed the style. Leonardo da Vinci is a very famous example of an artist in this style. The city of Florence is a birthplace of the Renaissance and in particular, of Renaissance art. The Proto-Renaissance begins with the works of the painter Giotto and includes Taddeo Gaddi, Orcagna and Altichiero and the sculptor Nicola Pisano. The Early Renaissance was the time of the painters Masaccio, Fra Angelico, Uccello, Piero della Francesca and Verrocchio, and the sculptors Ghiberti and Donatello. The High Renaissance was the time of Leonardo da Vinci, Raphael and Titian as well as Michelangelo who was famous as a sculptor and as a painter. The Mannerist period was the time of Andrea del Sarto, Pontormo and Tintoretto and the sculptors Giambologna and Cellini. The Battle of San Romano by Paolo Uccello. The Birth of the Virgin Mary, by Ghirlandaio. Cosimo de' Medici was intelligent, deeply religious, very rich, and wanted to be remembered as a man who did great things for Florence. He was a great patron of the arts and learning. He paid artists to make many beautiful paintings and sculptures. He collected many books, that were given to the Friary of St Mark so that a library could be made and many people could use them. After Cosimo, his sons Piero and Giovanni, and his grandsons Lorenzo and Giuliano continued to be patrons of the arts and of learning. They gathered a group of philosophers, poets and artists together in the "Medici Academy". This page was last changed on 20 February 2019, at 06:54.